The past year has not been good for me, especially in the end. My grandmother passed away on 27th of November and it had a huge impact on our family. I wanted to make 2017 a better year than the previous one, so I chose to travel to some divine places along with my mom and brother. When the word divine comes to my mind, Kasi and Tirumala always strike first in my mind. Since Kasi was a bit long, me and my family chose Tirumala. On the 10th and 11th of December, we set out for Tirumala. Tirumala hills located in the Tirupati city of Chittor District is a tousirst hub and major Hindu shrine. Tourists from across the globe come and visit Lord Venkateswara at Tirumala. No wonder it is the most visited Hindu shrine of the world. The scenic beauty of Tirumala lies in the hills alone. You can feel the warm presence of god the moment you reach the hill top. Before going to darshan, we went to local sight seeing spots like Sreevari padalu, Akasa ganga, Chakra teertham and Sila toranam. A visit of Srinivasa mangapuram, Govinda Raja Swamy Temple and Padmavathi Amavaru temple is a must. Most people just visit the lord balaji’s shrine but one has to definitely visit Padmavathi Ammavari temple without fail. Tirumala has changed from a simple Hindu shrine to becoming the largest visited Hindu shrine. Being a child I had no problems visitng Tirumala and getting a darshan. Now a days, you need to plan months ahead for a darshan and accommodation. The best way to get all this done is via the ttdsevaonline.com website. You can book a 300INR quick darshan ticket as well as accommodation online. If you want an accommodation at tirupati, you will definitely find many lodges and hotels. Make sure you plan well ahead for your accommodation as this is not easy if you want to stay in Tirumala. The following we planned to visit Ahobilam, Mahanandi, Yaganti, Chowdeswari Matha temple and Srisailam. Srisailam is situated in Kurnool and has a vast forest, the Nalla Malle forest covering it. Visiting Mahanandi, Ahobilam and Yaganti is easy as they’re situated around Srisailam. Mahanandi, Ahobilam and Yaganti are situated around a place called Dornala. Though it is a small place, most frequesnt travellers follow this path. You can easily hire a cab towards Mahnandi, Ahobilam, Yaganti and Srisailam. Best way to reach them is to book your private taxi for Mahanandi, Ahobilam and Yaganti. We first set out to dornala and stayed at a lodge. From there we hired a private taxi to Mahanandi, Ahobilam and Yaganti. We first visited Mahanandi through the nalla malla forest. One must enjoy the beautiful road puring through thick forest in the morning time. It’s just awesome. After about one and halh hour drive, you get to Mahanandi. It’s a beautiful place and you can find less number of piligrims here due to its distance from major centers. Then we traveled to ahobilam, another two hours of journey to reach this shrine. Ahobilam is divided to Eguva Ahobilam(Upper) and Diguva Ahobilam(Lower). The Lower Ahobilam opens from 9AM until 1PM and the Upper Ahobilam closes at 3PM in the afternoon. One has to carefully plan the visit keeping these timings in mind. 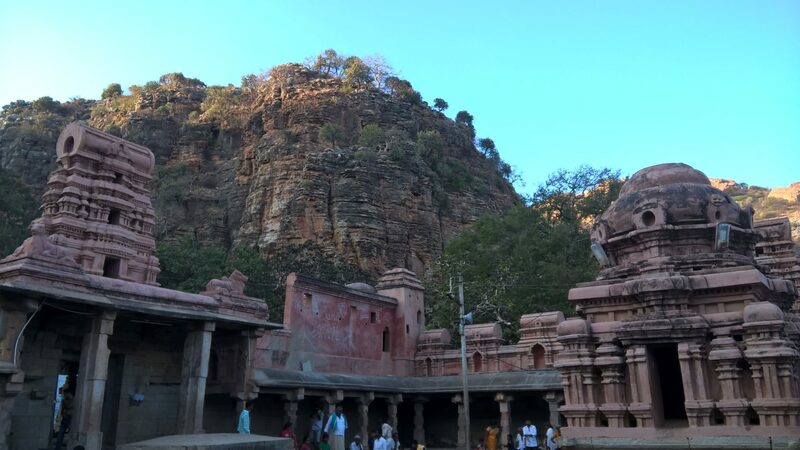 There are nine small temples on Lord Narasimha in the hills apart from Eguva Ahobilam shrine. It is said that anyone who visits all of them in a single day (6AM- 6PM) will be devoid of sins and attain moksha. Apart from Ugra Narasimha and Jwala Narasimha, all the others are easy to visit. These two need a bit of trekking and not for easy for people above 60 years of age. Many have visited these nine kshetras in one day i.e after sunrise and before sunset. The local jeeps can be hired to start early in the morning and visit all of them. You need to hire a guide to visit Ugra Narasimha, Jwala Narasimha and Ugra Stambha. Rest all you can visit yourselves. After Ahobilam comes Yaganti in our route map. Yaganti is a beautiful place located in kadapa district of Andhra Pradesh. This is built between hills and one can see both Lord Shiva as well as Lord Venkateswhara in a single place. The bull of Lord Shiva has been increasing it’s size since times and it is a big stunner at the temple premises. The next in our trip was Chowdeswari maatha temple. A bit far from Dornala forest range, this temple is very famous and unique. Here the Goddess has a moustache. It is said that she keeps a watch on your wishes from the time you visit her and if they true and pure, they shall be granted without fail. After this visit we had to start back to Dornala which was about a three hour drive. Driving through Nalla Malla forest in the night was simply marvellous. You can enjoy the cool climate the dark patches of forest within every curve of the road. The next day, we started to Srisailam. Srisailam is a shrine situated above hills and one has to reach it via car or bus. The ghat roads of Srisailam have to be enjoyed in the day time and you get an awesome view of the villages below. The ghat roads can be tedious for people who wish to trek but the real beauty can be enjoyed going in car or bus. The hill has very few sight seeing options but eventually you have to take a look at them to kill some time. We chose to go to Phaladhara, Panchadhara, Patala Ganga, Sikharam and other local temples on Srisailam hill. All of them are easily accessible by car. You can go by auto if you chose not to drive. The best part of Srisailam lies in its beautiful scenery and forest view. All in all it was a pleasant experience and a better way to rejuvenate for a new year. If you need any help in planning out your trip to these places, shoot me an email and I can clarify any doubts you got.